Colorado State Quarters are the 38th variety in a series of fifty design changes over a ten year period from 1999 to 2008. This Quarter was released into circulation on June 14, 2006. 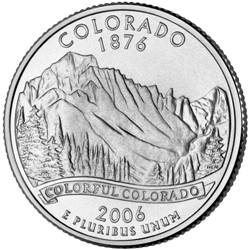 The reverse of the Colorado quarter features the Rocky Mountains as the central motif. Also in the designs foreground are evergreen trees that usually grow at the higher elevations. The reverse of the coin bears the inscriptions "COLORADO 1876”, "COLORFUL COLORADO" and "E PLURIBUS UNUM" along with the date of 2006.